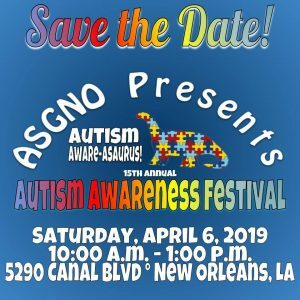 Pre-Registration for our 15th Annual Autism Awareness Festival is available now through March 30th, 2019! Just click the button below to visit our registration and team-building website where you can register, purchase shirts, and create a team to raise funds to support ASGNO! The top three teams will be recognized at the festival and will win prizes! Pre-Registration Pricing: $10 individual, $25 for a family of three-four, Kids 3 and under Free! On-Site Registration Pricing: $15 individual, $35 for a family of three-four, Kids 3 and under Free! Each registration includes admission to the fest, access to all games, activities, live music, and resources, and one complementary trip through the cafeteria per person registered. Additional meal tickets for registered attendees can be purchased during pre-registration, or onsite at the fest. Thank you for supporting ASGNO, we look forward to seeing you at the fest this year! All online transactions are subject to minimal processing fees as listed on the registration website. Thank you for supporting ASGNO!